You too may want to be a choir member and experience the thrill and satisfaction of making beautiful music. Many years ago I attended a prayer luncheon with a friend of mine. During the program a man sang a solo and his vocal quality left something to be desired. Later, when I made an unkind remark about his vocal ability to my friend, he reminded me that the scripture tells us to make a joyful noise to the Lord. It doesn't specify what the quality or even the content should be; only that it be a joyful noise TO THE LORD. 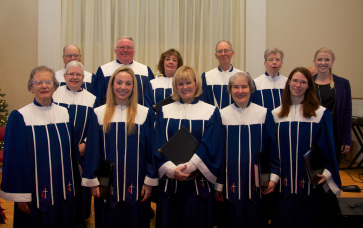 I have sung with many men and women over the years who didn't necessarily have good solo voices, but when blended in with a larger group, the entire choir sounded better and we made a more joyful noise than we could have without them. Since so many of our Anthems and Hymns are written about biblical events you have a better chance of understanding the meaning through studying and practicing the music than you do when someone reads the same passage to you from the Bible. Communion and Choir have something in common in our church. All are welcome to participate.